So, what's going on in the world of 8-bit bedroomware? New games in development, updates to AGD and anything else of interest - or not! MPAGD has been updated. The latest version, 0.7.3, has new sprite behaviours added to the script generator. If you ever wanted a power-up sprite rotating around your player or a big boss enemy with sprites rotating around it you can do that very quickly. Pushable blocks have also been added alongside other features. A new Enterprise option has been added to the editor. There are editor and compiler bug fixes, a second default font, a new tool to check for missing player spawn points, an option to import AGD 4 and AGDX games from TAP files and AGD's CONTROLMENU command is now supported, generating equivalent MPAGD code with the added bonus of a space where you can write your own redefine keys routine! The compilers now have options to generate code specifically for SjAsmPlus and WinAPE and the documentation (all 52 pages of it) has been updated. That ought to keep everyone going for a while. Leaving the Spectrum scene has its advantages. I've had plenty of time to do other things and pursue other hobbies rather than writing Spectrum games or hanging around on scene websites and social media. My old Twitter account name has even been taken by a rather tragic individual who is pretending to be me. For starters, I've updated this site. The more eagle-eyed among you may already have noticed that I've added more games to the History page - go have a read if you haven't already. I've been uploading games to my page on itch.io and have designed a few Egghead and Arcade Game Designer themed T-shirts, mugs, notepads etc for anyone who might be interested. Leaving the Spectrum scene doesn't mean that users of other 8-bit machines will be neglected. 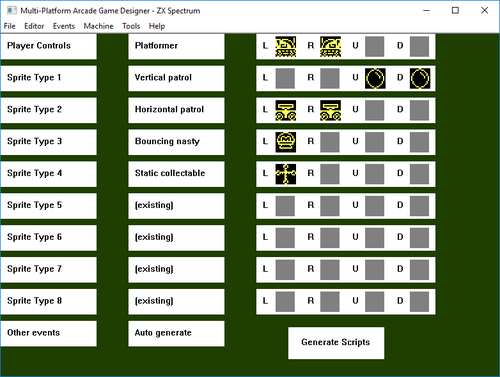 As promised last month I'm still supporting Multi Platform Arcade Game Designer and there will be a new version with a couple of fixes for the Acorn Atom and (hopefully) a little new functionality before very long. I'm seriously considering setting up a website or two for my other hobbies as well.